Congratulations on Mina!! What a cutie. Love the shirt! How are you feeling about things? How is your recovery going? How is breastfeeding? Feel free to email me if you have any questions or just need someone to listen. These first weeks can be overhelmingly busy and exhausting, so do your very best to take care of yourself as well as the baby. And if that means being out of touch for a while, I’m sure everyone will understand that too. MO. You made the PERFECT BABY. And gave her the PERFECT NAME. I, like, turned 25 and became VERY INTO babies all of a sudden. But seriously, she is beautiful and congratulations, what a wonderful addition to your family. Congratulations! Rest well, and enjoy this time. Yaaaaay! She’s adorable. And that is an absolutely fabulous name. Congratulations! Look at that face—gorgeous. Congrats! Huge congrats, Mo! She’s adorable! What a beautiful, wise little face. Wishing you all the best. Mina is beautiful, congratulations and welcome to the world little one. Many congratulations to you and your family on the new addition! Mina is just lovely. Holy cow she’s so adorable!! Congrats! Well Hello Mina! Welcome to the world. She is perfect. Love the onesie!! Congrats to you and your husband. Great work! What a beautiful addition to your family. Your lives are changed forever by this new, beautiful creature. Congratulations. Congratulations!!! Looks like another thinker! She is so beautiful! Congrats and take your time she will only be small for so long. Li’l Wigburg! Congratulations–she is lovely! Welcome to the world, beautiful Mina. And congratulations to the wonderful mom and dad. Well done. A beautiful new soul to grace us with her laugh and smile! my “baby girl” will be 29 in september, the “baby boy” just turned 18.
if you want some “mama wisdom”… you cannot spoil baby by holding them too much. there is no such thing as “too much” in telling a child that they are good and lovable and special. even when you have to discipline, remind your child that the ACTION is bad, but you still love her. there are not “too many” hugs and kisses and snuggles with your baby. Hey Mo! It’s Meg from JournalCon, back in the day. I was just looking at my contacts in Flickr and saw your sweet Mina. Congratulations!!!! 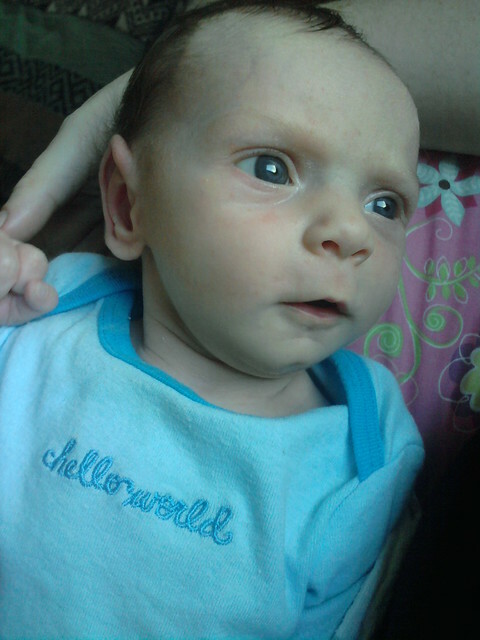 I just had a baby myself, a boy, back in Feb. His name is Homer, and he was the same birthweight as Mina. :) Anyway, just thought I’d say hi and congrats!! Mo! Congratulations! She is so lovely. I was just following links from feministy-type blogs because of Melissa McCarthy stuff and then my brain was eaten by THE CUTEST BABY I’VE EVER SEEN. Don’t tell all my new-parent friends or they’ll kill me. EEEEE BABY!